Listed below are the most popular Miami sightseeing tours, shows, activities, attractions, transfers and passes. They were selected from the complete collection of tours and attractions that are available for this destination. These are the most popular, the best-sellers, the ones people purchase and enjoy time after time. For the complete list of activities for Miami, click here. On this tour you will discover the beautiful side of the fashionable and exciting international hot spot, Miami. Mansions, yachts, Port of Miami, Little Havana and Calle Ocho, South Beach Art Deco district, Coconut Grove, Brickell Avenue, and Coral Gables are some of the highlights. To get the quintessential Miami experience, visit the lovely open-air market of Bayside, where you can browse the artist's carts, sip an iced drink and stroll along the pier. Here, there are more than 100 shops and 30 restaurants which make this a wonderful place to stop. This is more than just a mall; it is a sweet slice of south Florida life, where you will enjoy Miami's beautiful skyline along the Biscayne Bay and delight in the fresh ocean breeze. Complete your day with a journey aboard a unique, narrated sightseeing tour of Miami and the homes of the rich and famous on "Millionaire's Row". No visit to South Florida is complete without a journey to Key West! There are plenty of ways to enjoy your time on this culturally and history-rich island. You can take it slow with a leisurely day soaking up Key West's laid-back atmosphere, quaint shops and outdoor cafÃ©s or if you are looking for more activity, there are upgrades available. Get out on the water on a glass-bottom boat ride, snorkeling cruise or parasailing adventure, or see the attractions on dry land on the Hop-on Hop-off Trolley Tour or with a ride on the Conch Train. The 12-hour day trip from Miami to Key West is a mesmerizing trip not to be missed. Visit the Everglades National Park and Biscayne Bay Boat Tour all in one day! Leave Miami behind, head to the Everglades in your air-conditioned bus, and start the day with your Everglades Airboat Adventure. A trip to Miami is not complete without touring the Florida Everglades by airboat – it's nature at its best. Your 30-minute airboat ride through the Everglade wilderness includes full narration from your airboat captain-guide. In the unique ecosystem of the Everglades, you'll see breathtaking panoramic views, lush vegetation and enjoy complete tranquility. After the airboat ride, you'll spend over 2 hours in the Everglades National Park to visit the alligator wildlife show with plenty of time to take a wander along the jungle walking trail filled with crocodilian exhibits. The Everglades airboat tour is truly a memorable and exhilarating adventure! Return to Miami for the second part of your day and step aboard your Biscayne Bay Cruise. The cruise is an unforgettable way to see Miami from the tropical waters of Biscayne Bay. During this 90-minute cruise, you'll see the city skyline, Fisher Island, Miami Beach and the port of Miami's cruise ship and cargo districts. You'll also see the homes of the rich and famous including Gloria Estefan, Shaquille O'Neal, Diddy and many more. With plenty of seating both inside and out, the boat's lower salons are enclosed, air-conditioned and have full facilities. Upper decks are open air with partial awnings. Soft drinks, beer, wine, cocktails and snacks are available for purchase on board. A trip to Miami is not complete without touring the Florida Everglades by airboat – it's nature at its best. Next, you'll visit the alligator wildlife show with plenty of time to take a wander along the jungle walking trail filled with crocodilian exhibits. The Everglades airboat tour is truly a memorable and exhilarating adventure! Explore Miami on your own way with the flexible Go Miami Card. Do as much or as little sightseeing as you like, at your own pace while saving precious vacation dollars. Receive free admission to popular Miami attractions, and enjoy discounts on shopping and dining around town. The Go Miami Card leaves you in control, allowing you to have the best, customized experience possible. The Go MiamiCard is available for one, two, three, five or seven days. You may visit as many attractions as you like in one day, but you are limited to visiting each attraction only once per day. The Go Miami Card also offers a wide variety of free gifts and discounts at some of Miami's best retailers and restaurants. Full details are available in your guidebook. See 'Itinerary' below for full list of included attractions. Experience Miami's highlights by boat and bus on this combo tour. Take a sightseeing coach tour through the city and explore beautiful South Beach, the historic Art Deco District and bustling downtown Miami. Then, relax on a cruise along Biscayne Bay to admire the skyline and spot celebrity houses. Top it off with a thrilling airboat ride through nearby Everglades National Park! After pickup from your Miami hotel in the morning, you'll take a narrated coach tour to see Miami's highlights including the historic Art Deco District and South Beach, a lively beachside area brimming with restaurants and hotels. Explore downtown Miami, a skyscraper-filled metropolis, and continue to Cuban-influenced Little Havana. Other interesting sites include the Gianni Versace Mansion, Madonna's former house on Brickell Avenue and the secret spot where Michael Jackson filmed his ‘Thriller' music video! You'll have time to enjoy a meal break in Little Havana before embarking on the next part of your adventure. After your coach tour, you'll be taken to Biscayne Bay to board a boat for a 75-minute sightseeing tour. Learn about the history and culture of Miami as you cruise past various islands. Pass the Port of Miami, see celebrity houses dotting the coast and admire the Miami skyline. Up next is the third part of your Miami experience: an Everglades airboat tour! Take a 45-minute drive to Everglades National Park for a thrilling 30- to 45-minute airboat ride through lush marshlands. With the help of your onboard naturalist guides, spot wildlife including alligators, turtles, snakes, fish and exotic birds, and learn about the animals and their environment during the wildlife show that follows. An onsite store provides refreshments for purchase. After your tour, you'll be taken back to your hotel. Take to the waters of Miami for a fabulous cruise on Biscayne Bay! This 90 minute cruise takes you by the homes of some of the world's "rich and famous" (called Millionaire's Row), along the stunning Miami Skyline as well as the Port of Miami and more. Treat yourself to a break from the busy Miami lifestyle and just enjoy! See Miami's spectacular coastal sites including the beautiful downtown Miami skyline, the Port of Miami, Brickell Key, Fisher Island and the celebrity filled islands of Miami Beach known as "Millionaire's Row". Here, you'll see the homes of Shaquille O'Neal, Gloria Estefan, Julio Iglesias and more. You will also see the home where they filmed the Al Pacino classic - Scarface, aswell as the former home of notorious gangster Al Capone. We have lift-off! For a great family day trip from Miami, visit one of Florida's most popular and fascinating attractions, the Kennedy Space Center. Take a virtual flight to the moon and back, enjoy an IMAX film and visit the US Astronaut Hall of Fame on this kid-friendly, full-day tour from Miami. 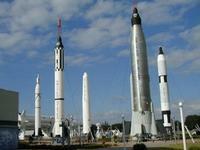 Your day trip to the Kennedy Space Center Visitor Complex begins with pickup from your Miami hotel. From there you'll head to up to Orlando and change vehicles to head over to the Space Coast. Your Kennedy Space Center visit includes a tour of NASA's launch headquarters, the Shuttle Launch Experience, two IMAX films, a visit to the US Astronaut Hall of Fame, and additional shows and exhibits. Visit the LC 39 Observation Gantry for a bird's-eye view of the space shuttle launch pads. Stop at the Apollo/Saturn V Center, where you can walk beneath a massive Saturn V rocket. Relive Neil Armstrong's first steps on the moon, and experience the thunderous rumble of a Saturn V moon rocket lift-off. Watch IMAX movie screenings of Hubble 3D, narrated by Leonardo DiCaprio, or Space Station 3D, which takes you on a virtual trip to the International Space Station. Other exhibits and activities at the Visitor Complex include the Astronaut Encounter Show, where you have a chance to meet an astronaut, and the Shuttle Launch Experience, where you can find out what it feels like, looks like and sounds like to launch into space and orbit Earth aboard a simulated space shuttle. You'll enjoy 4 to 5-hours at the Kennedy Space Center before heading back to Miami. The half-day Ultimate Miami Watersports Adventure is the wettest, wildest, most action-filled way to enjoy your time in Miami. An array of activities like snorkeling, sailing, jet-skiing, kayaking, swimming, jumping on the water trampoline or just relaxing in the beautiful waters of south Florida makes this watersports tour one of the most enjoyable ways to spend a day in Miami. Water, soda and snacks are included. If you're a sun-seeker or action-lover, there's no better way to spend your time in sunny Miami than in the warm blue water! After pickup from your hotel, your half-day Ultimate Miami Watersports Adventure begins as you board a 60-foot (18-meter) catamaran that will take you on a pleasant sail. Enjoy incredible views of Miami and the downtown skyline as you cruise through the water. You'll anchor off Key Biscayne Beach, near a sandbar where the boat will set up shop so you can begin your day of adventure. From this spot, you can kayak, snorkel, jet ski, swim or simply relax. Take a turn jumping on the water trampoline, and then work on your tan. Snacks, water and soda are included, and unlimited beer is available for USD$15 (payable direct at the time of check-in; only for those 21 and up). Take the stress out of getting to Walt Disney World from Miami with this convenient one-day admission ticket that includes transportation from your Miami hotel. Travel to Orlando in the comfort of a deluxe air-conditioned motor coach, and spend the day at one of six Walt Disney World parks, including the Magic Kingdom and Epcot. With round-trip transportation from Miami, it couldn't be easier to spend a day at Walt Disney World than with this one-day admission ticket. You can choose one of six Disney theme parks: Magic Kingdom, Epcot Center, Disney's Hollywood Studios, Disney's Animal Kingdom, Disney's Blizzard Beach or Disney's Typhoon Lagoon. Enjoy free breakfast on your modern, comfortable coach, including fresh muffins, orange juice and fresh coffee or tea. Soft drinks and other juices are available for a nominal fee. 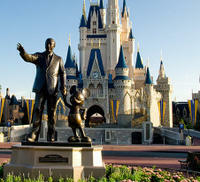 When you arrive in Orlando, you will have approximately six hours to spend at the Walt Disney World park of your choice. After your day of Disney fun, board the bus for the relaxing and stress-free ride back to Miami. See the Itinerary section below for details on each Disney park.